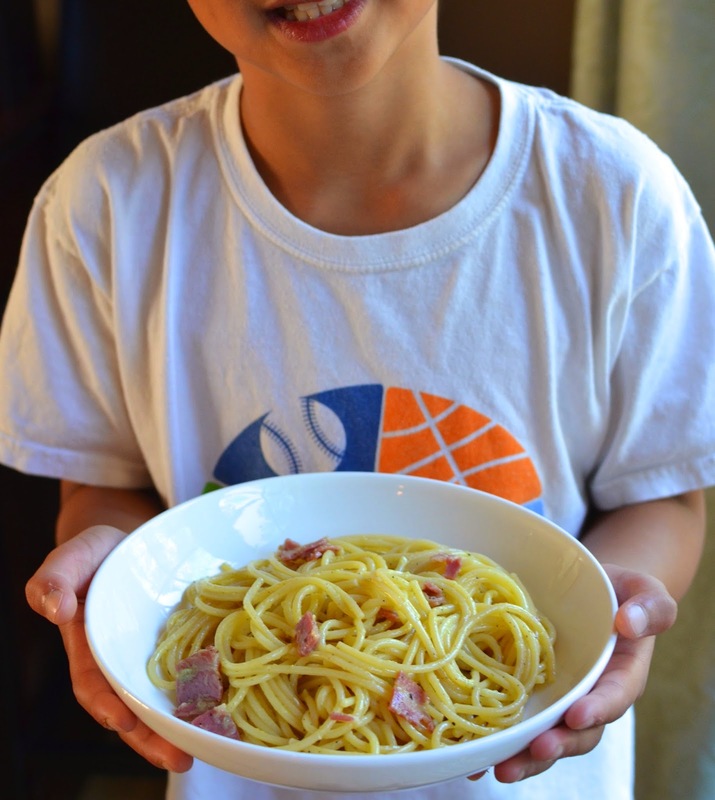 One of the dishes we cooked together this summer was spaghetti carbonara. I think I was initially inspired to include this in our cooking sessions by a post I read over at The Kitchn but I can't remember exactly. What I do know is I wanted to make a few savory dishes with the little one and spaghetti carbonara is one of my favorite things to eat. My husband and I have had many a date night over a big bowl of it with a little salad on the side. The little one is ironically not generally a big pasta-lover (ironic because his mother is a carb fiend) but I know he likes this because I've made it on occasion for all of us. I thought it would be a quick, simple, yet delicious meal to make together. My son is a huge fan of bacon (though I use pancetta in my spaghetti carbonara but this gave him a chance to compare the two) and who can resist the simplicity of that creamy, salty sauce against the hearty pasta. The great thing about this recipe - it's easy! I wanted to show the little guy that he could make a delicious dinner with a few ingredients. At the same time, cooking this stretched us. This was the first time I let him cook over the burner and well, really cook! You can trust that I was standing no more than half a step away from him at all times with the stove on and real cooking going on! But before we know it, he couldn't believe we were done and the pasta was being tossed and ready for dinner. And the best part? He loved the result. Of course, his dad and I were major cheerleaders (not a tough job) and helped him polish off every last bite. It went down real easy! This was one of my son's favorites from the summer cooking sessions...so it was a huge success. When I was making a list of possibilities for these cooking sessions, I quickly thought of garlic bread because my boy is crazy for it! It's one of those cases where he'll just fill up on garlic bread if it's on the table. I usually buy garlic bread from a local bakery but decided we would learn to make it from scratch together. For the most part, we got a workout trying to squeeze the garlic out of our garlic press! A little stirring to mix the garlic paste with some olive oil and butter, and we were ready to spread the mixture onto a crusty baguette. We enjoyed the first loaf with his favorite meat sauce (Ina Garten's weeknight bolognese that we have Marie @ little kitchie to thank for!) for dinner one night. You're going to see a pattern...we loved our garlic bread. What's not to love about garlic bread, particularly when it's made with your kiddo. We've whipped this up twice now and it's something nice to stock in the freezer. From now on, we have our "house" garlic bread to revert to. I have often proclaimed my love of eggs. I always have a dozen or two in the fridge and I cook and eat eggs pretty much on a daily basis. When my son was young, a toddler, he had a sensitivity to eggs. He had no problems eating anything made with eggs (e.g., bread, cakes) but if he ate pieces of whole egg, he would "coincidentally" throw up (sorry for the details!) and get a pink ring around his mouth. So I stayed away from cooking eggs for him for a long time. Then, at some point a few years ago, that sensitivity disappeared and as it turns out, he's also quite fond of eggs - fried, scrambled, etc. Maybe because it's one of my favorite things or because I consider eggs a great basic 'survival' food, one of the first things I ever taught my son how to do, cooking-wise, was to crack eggs. We have progressed from egg splattered onto our faces (and all over the table) during the first attempts to a very proficient egg-cracker now. It makes a mom so proud! *Tip: in the beginning, use big/huge bowls to crack eggs or to stir things around in (same with skillets when cooking). So believe me, we are constantly cracking eggs in our house and the little one is my best helper. One day, I decided we'd do a very quick cooking lesson and simply learn how to scramble eggs in a skillet and throw in a few bits of ham to bulk it up. That, with a piece of toast, made a simple lunch and is hopefully something easy he can make for himself at some point down the line. I wanted to give him the idea that it isn't hard to fix yourself something nutritious and tasty to eat. Sometimes, the most basic and humblest of foods can be the best. I bake a lot (obviously) and the little one has made plenty of appearances in those endeavors. I wanted to make sure we did some cooking in addition to baking this summer but of course, we don't stray far from the sweet side of life for long. So on the sweet side, we made chocolate chip cookies for 2. I used this recipe from No. 2 Pencil that I pinned a long time ago. I like it because the small scale lets us do everything by hand and get more involved that way than when the mixer does all the work. In no time, there were generous chocolate chip cookies. These were for the chef and his dad, who appreciated them to no end! And it's true what they say about kids being enthusiastic about food they helped prepare. The cookies were on the soft side and I was afraid he wouldn't like them much but he was full of praise for his cookie, which gave me a good chuckle. Baking is definitely a great thing to do with kids. Not only is the result good to eat but baking allows for plenty of measuring, stirring and playing, and you don't need to worry about flames or boiling water and whatnot as you often do with cooking. My son's been in the kitchen lately doing things like learning how to make his favorite banana muffins and we've done quirky things like chocolate mug cakes (which I called "magic cake"). Things like mug cakes are fun because they're fast and there's a bit of mystery involved. Kids love a plot and being able to make a cake in a cup, in the microwave, in a few minutes, definitely qualifies. I had wanted to make baked fish sticks with my son but we're not a big cold cereal family so I didn't want to buy a large box of cornflakes for the project and couldn't find one of those small individual-serving boxes of the plain cereal. So I switched over to baked chicken tenders instead. Almost every kid loves chicken tenders and my son is no exception. I love this baked "fried" chicken recipe and make it often for dinner so I decided to use that recipe as a foundation. Instead of chicken thighs, we used chicken tenders. Next time, I might cut the chicken up into bite size chunks and we can make "nuggets." We use panko breadcrumbs so we learned what that was and the whole idea of making the wet base and dredging the chicken in steps. I think, overall, he's been pretty amazed by how easy many recipes are. I often get "that's it? that's all we have to do..." and I'm hoping that the simple recipes encourage him to continue to want to cook in the kitchen. This recent dinner of baked chicken tenders, with baked steak "fries", was a big hit. We love to say everything "sold out" and those chicken tenders disappeared quick! So it's been a pretty busy summer! I'm grateful for all the time we got to spend together and the time spent in the kitchen and then sitting down at the table with my fellas are among my very favorite. In thinking about these summer cooking sessions and all the cooking projects my son and I have dabbled in - from "pancakes" to pretzels, donuts to cakes (and even marshmallow treats) - I'm really glad I stuck with it and encouraged him to cook and bake with me little by little. Even if your child isn't innately enthusiastic about cooking, I encourage you to keep that kitchen door open. It's truly worth the effort and you might be amazed by how interest develops and how natural it may become to have a little helper on standby. Thanks for indulging in this mom's little show-and-tell today! I'll leave you with this spaghetti carbonara recipe below. I've been pulling out the well-worn written recipe - something I scribbled down long ago but remember it came from Tyler Florence - and making it for years. I love the simplicity and deliciousness of it. It isn't too rich but just luxurious enough to satisfy. Bring a large pot of water to boil. Salt water generously and cook pasta until al dente, as per package instructions. In a mixing bowl, whisk eggs and parmesan cheese (and a bit of black pepper) together until there are no lumps. As pasta cooks, heat olive oil in a large pan or deep skillet over medium-heat. Add pancetta and cook until fat is rendered and pancetta is just beginning to crisp, about 3 minutes. Add garlic and stir together for about 1 minute. Add hot pasta into the pan and stir well for about a minute to thoroughly combine. Remove the pan from the heat, add the egg and cheese mixture and stir to combine. (Mixing off-heat and stirring the mixtures quickly together will cook the eggs without scrambling them.) Take some pasta cooking water (it may take 1/4 to 1/2 cup) to thin out the sauce a bit. Add a generous sprinkle of freshly ground pepper. Taste, and adjust for salt and pepper, as needed. Plate pasta into bowls and serve immediately while it's hot. Starting late clearly didn't hurt you much, Ashley! And "only" knowing how to make baked ziti is pretty advanced! ; ) Thanks and have a great long weekend! I love that you're teaching your son to cook. One of the best skills you can grow up with, for many reasons! My dad has always loved cooking and still inspires me to this day! Thank you! I'm glad your dad inspires you so much! Wow this looks so amazing! I need a big bowl of that now! wow Monica, you are a super mama. Obviously you two had a great fun in the kitchen. I wouldn't have the patience to cook with kids at all. I love everything you two have been cooking too. Man..those roasted potato wedges and crisp chicken tenders are to die for! Oh no - I am not being humble when I say I do not deserve any such title and believe me, patience is not my virtue! : ) It was hard at first...my son was not naturally interested in being in the kitchen and I was a nervous wreck with the mess of it...but slowly, it's gotten much more natural. I'm glad I rode it to get to this point! Thank you for the kind words, Angie. That's awesome that you have been giving your lil guy cooking lessons and teaching him a such a valuable life long skill and appreciation for cooking. I love all the dishes you guys made, they all look and sound amazing! So so proud of you and your son - that's fantastic that you are seeing so much progress in his skill and confidence level. At the time I hated it but looking back now I am glad my parents started to allow me to help them in the kitchen at a young age too and I hope to do the same thing with my lil guy...I only hope he will show the same enthusiasm as your son :) That spaghetti carbonara and garlic bread look amazing - wish I was having that for dinner tonight! Awww..thank you for all your kind words, Kelly. I don't know...on some levels, I'm just being a little selfish hoping my son will develop some interests that I have. As it is...we have so little in common! He is full-on boy and I am all girly mama! haha. But the cooking thing has become a lot more common/easy and it's really nice to share something with him. I laugh thinking you hated helping in the kitchen as a kid! You see - you never know! What a sweet post Monica! so nice you and your little guy had special time together in the kitchen. You are too kind, Wendy - thank you! I am laughing about your son's specialities/preference for carbonara and omelettes! No kidding! I love it! I do truly want my son to have some basic cooking skills so he can take care of himself down the line. I had a vision of him totally clueless as a grown man if I didn't intervene and do something about it. All that said, he's liable to forget everything the minute we turn around so who knows...a girl can only try. In the meantime, it's a lot of fun these days and I'm actually amazed by how many things we've cooked together or how often he steps in to help me prepare something. I never would've thought that possible 4-5 years ago. Aww I love how much your son has been helping in the kitchen! Do I spy a future food blogger in the making? I very seriously doubt it!! I think he has a good time in the kitchen now but he's also happy to wash his hands and move on when we're done! How fun! I am loving having the kids in the kitchen. And, I especially love the pancetta in this ~ what a great addition! I prefer pancetta in carbonara for whatever reasons. My son likes it a lot, too, so we'll stick with it. Goodness knows, we have enough bacon for breakfasts! Aww this is too cute! I love all the dishes you guys prepared together! What a special time for mother and son! Monica,this is such a lovely post! What a great mum you are for giving your son these life long skills. He will always love to be in the kitchen, just like you. I would love to do something like this with my kids but I think I need to 'conquer and divide'a little - they all want to break the eggs, they all want to mix etc. it's total chaos - I need to manage more efficiently. Anyway, you have inspired me to try something new. Have a great weekend! Your sons have so much to learn from you! I love that you enjoy the sweet side - cookies are the best! Thank you! This is such a lovely post Monica! I love the idea of kids helping out in the kitchen :). Yay - thanks, Marie! That red sauce...we just love it. I make a batch, we eat half immediately and freeze the other. My son gets so excited if he thinks I'm making *the* red sauce, as though there's no other. He really loves it, as do we, so thank you for introducing me to it! Hope you're doing well and adjusting to being back to school! Oh Monica, this is such a cute post...I love the idea of teaching kids...and I am kind of embarrassed to let you know that in spite of loving carbonara pasta, I never made it myself...I would take a lesson from your son...the pasta looks fabulous! Well done! It would be terrible to grow up without knowing some basics of how to cook so this is a great idea :D And doing a tasty classic like carbonara is a tasty way to convince them to learn how to cook. Thanks! The young ones know good, classic food better than anyone else. I'll be cooking this up with him often. Wow! My daughter too enjoys cooking and baking. Its so much fun to get her involved. A fun activity to do together. The pasta and all the food looks incredible! I'm glad your daughter likes cooking and baking with you! Maybe she will inherit your amazing talent for cookie-decorating! It must be awesome for a girl to have a mom who can create all those amazing cookies. I love kids involvement in the kitchen and you did an amazing job as a helper! I often stop the kids helping me because they make a mess etc... I should be more open minded because I can clean it later. :) It boosts up confidence in kids. I have to re-think about my approach too!